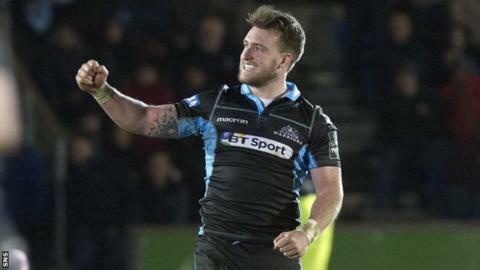 Glasgow Warriors wing Tommy Seymour heaped praise on Stuart Hogg following the 27-17 Pro12 win over Ulster. The full-back, 23, and Seymour, 27, both scored tries at Scotstoun, with Hogg adding a huge last-minute penalty. On Thursday, Scotland's Hogg was named 2016 Six Nations player of the championship. "He's riding high in confidence right now," said Seymour. "When Hoggie's got confidence, I don't think there's a better player around." A total of 12 Scotland players returned to defending champions Warriors' squad for Friday's meeting with Ulster. And victory put Glasgow level on points with their fifth-placed opponents, with a top-four place required to progress to the play-offs. "The boys were giving Hogg a bit of stick," Seymour told BBC Scotland. "He showed that form with two pieces of skill, first with the try - to finish it off like that under pressure was fantastic - and I think the crucial bit was the penalty at the end. "He's getting everything he deserves." Seymour also highlighted the influence fly-halves Finn Russell and Duncan Weir had on his own try. "Finn put the ball across and it was obviously a lovely weighted kick so it allowed me to not even break stride and take it on," he explained. "It's great to see the 10s analysing the game and putting in the skill when it's needed."